This piece of art is a 100% handcrafted product made of natural bamboo. They can be used for serving purposes and also for using it as a table top decor item. 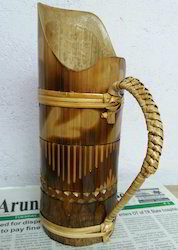 Description: Beautiful bamboo jug which can be used to serve water or juices. Developed By The Humbled Artician Who Endowed Their Utmost Love And Passian To These Artifacts, Moulding Them Into Vessels Of The Rediant Beauty Of Their Own Simplicity And Selflessness. Footbridges made using structural quality treated & processed bamboo. The products we offer find enhancing the looks of varied parks, restaurants, farm houses, lawns & Children play area. All our products are well-known in the market for their characteristics like attractive looks, splendid finishing, resistance against termite and ability to withstand extreme weather conditions. - They have an important place in social life of the tribal. - Bamboo articles are essential to perform any marriage thread ceremony, birth or religions different type of furniture, household utility goods and also decorative pieces, by expert artisans, who inherit their skill from their ancestors. High Quality Bamboo Products from Nagaland, Manipur, Mizoram and Assam.